At Venerdi our menu consists of a lot of pasta dishes. To achieve the best tasting dishes you need to use fresh ingredients. 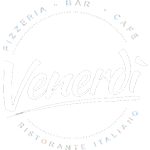 We make our pasta and bakery fresh at Venerdi so that we can provide you with the tasty dishes that are on offer on our menu. You need to try to understand the difference in taste when fresh ingredients are used.